I was there for the contents and the house, Miss Walker was there for the Easter egg hunt so everyone was happy. Standen was built in the 1890s for a London solicitor, James Beale and his large family (seven children, plus, later, their families too). 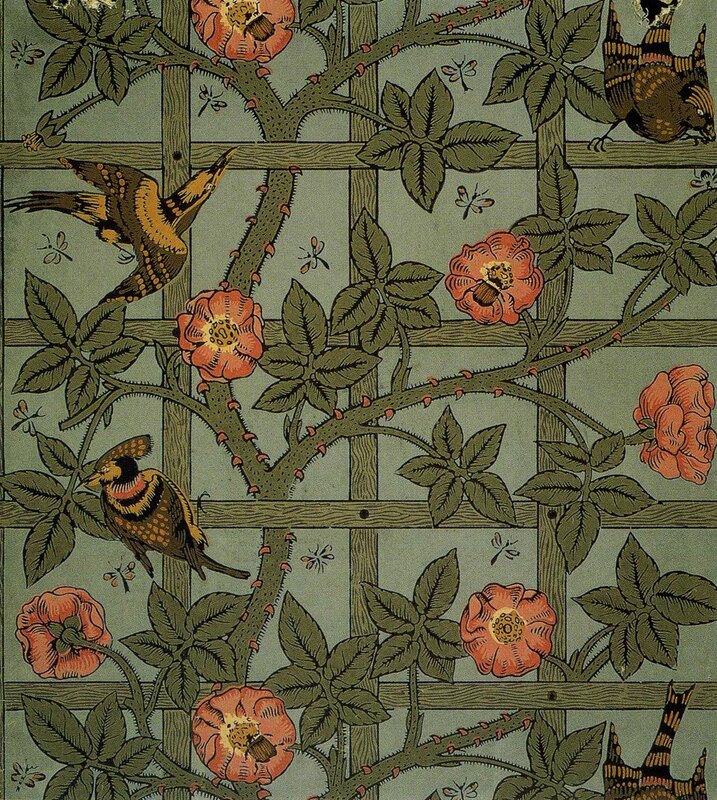 Beale chose Philip Webb to design the house, and Webb and Beale furnished and decorated with Morris and Co fabrics and wallpapers, together with their furniture and Victorian art pottery, such as William de Morgan. 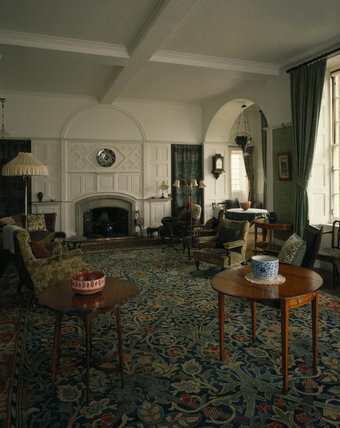 The Victorian Drawing Room. I was prepared to hide behind the chair and live there. There are gorgeous long corridors papered with this, with birds darting between the rambling reach of the roses, and the little beetles hiding among the petals. I made my daughter stand and look at a wall for an unforgivable amount of time because it was just so damn beautiful. Really, Mr Morris intended us to see his design on a massive scale and it cannot be beaten. 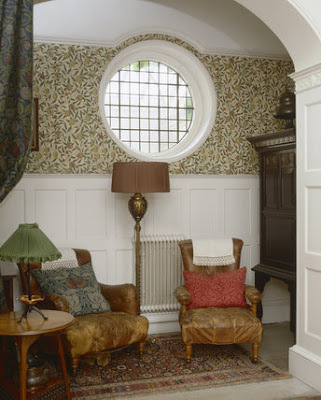 I find there is something reassuring about a round window, possibly it was my 1970s, Tolkienesque upbringing in the 'Shire' (Wilt'shire' to be precise) and Arts and Craft architecture is rather resplendent with them, making even the grandest house seem cozy and homely. Obviously, for a family that valued the Arts and Craft movement, the art they chose reflected their taste and Standen is filled with the most delicious pieces. 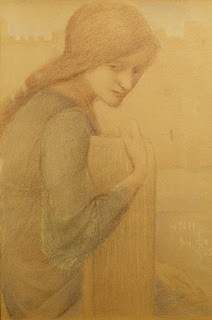 Take the above Rossetti which I had not seen before. If I had to name the model I would go with a slightly odd picture of Jane Morris or maybe Keomi the Gypsy. It doesn't really look like Ellen Smith who is the other dark haired model of this time, and all the other likely suspects were blonde or redhaired. 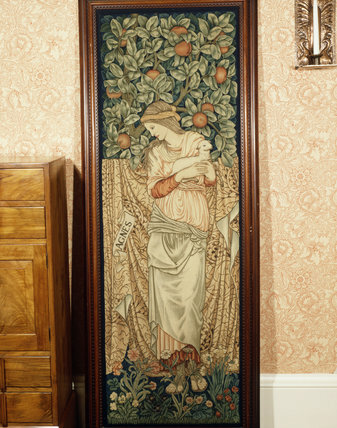 There are a lot of drawings and designs by Edward Burne-Jones, in keeping with the Morris and Co furnishings, and the tapestry of St Agnes is especially beautiful, with the figure by Burne-Jones and the foliage that surrounds her by Morris. 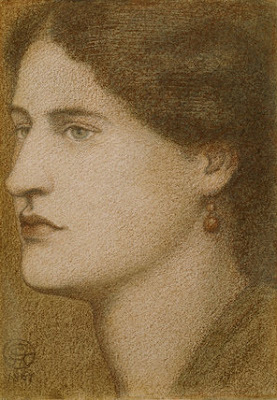 There are also works by T M Rooke, Ford Madox Brown, Frederick Sandys and so on and so on. There is art on every wall and beautiful art pottery on every shelf making this a house to appreciate slowly so you don't miss a single beautiful thing. The garden curves around the house on different levels so you can appreciate the house from all angles while walking through some beautifully tended, unpretentious woodland and garden. I can thoroughly recommend Standen, especially if you have enjoyed Wightwick Manor. For further details, look to the National Trust website and see for yourself. I take it you brought your own wombat - I suppose it would have been too much to ask for the garden to be infested with them. 'Thank Wombat it's Friday" is now my new catch phrase. What a wonderful house. It is such a treat to see the Morris interiors too - thank you for sharing. 'Thank Wombat it's Friday' indeed! i'm fairly sure the unidentified profile head by DGR is drawn from Fanny - certainly from someone who is wearing her ear-rings! Hello Jan Marsh, we love you. It reminds me a little of that other very 'flat-faced' picture of Fanny (the location of which has slipped my mind, although I thought it was at the Beecroft in Southend, but I might be mistaken) but the colouring and the date seem odd. Yes, you're certainly right that those are her earrings, but they aren't the gold hoops I normally associate with her. Oh Rossetti, you tricky devil! Thank you for your comments (and we love you Jan). I too must side with Ms. Marsh, though without benefit of earrings. I believe we are both thinking of the same "'flat-faced' picture", and I also would point out that there is (a) not enough hair crimp and (b) not enough belladonna in the eyes for me to suspect this of being Janie. I'm slightly envious of your trip, as Morris furnishings are thin on the ground here in Maryland. On the other hand I will manage to force myself to accompany my wife to the Pre-Raph exhibit at the NGA in spite of the disapproval of the Art Authorities at the New York Times. I thought it was in the Beecroft Art Gallery because the splendid Karen Jones did a series of pictures based on Fanny and the work in the museum. My only objection to it being Fanny is the colouring, it seems too dark, especially when compared with his other works of her at this time (one of which is even highlighted in gold). Mind you, he wasn't above swapping hair colours around (hence the red-headed Jane Morris pictures) so who knows? If you haven't seen Karen's pictures of Fanny, I can thorough recommend a Google for them. She did an extraordinary job of bringing Fanny alive in such a moving way.